Take the caddy and all the bottles, jars, cans and everything else out of the shower—you can’t clean what you can’t reach. Spray the shower and let the chemicals work—too often we are in a hurry and we don’t let the chemicals do their job. Spend the time cleaning the shower caddy and wiping off all your bottles and jars so they are ready to go back in place. When scrubbing the shower, remember to start at the top and work your way down using a medium-bristle brush. If you can find a scrub pad on a telescoping rod, you won’t have to reach either too high or too low. Once the walls are scrubbed and clean, rinse the walls by pouring cupfuls of water over the walls. 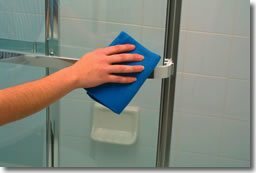 When rinsed, use a microfiber cloth on the walls and dry the entire surface. Scrub the floor using the same method as for the shower. Spray the mixture on the floor and let it work itself in; then scrub with the brush, rinse and dry. If you have a shower curtain, take it down and put it into the washing machine on a gentle cycle. Letting it soak in a light solution of detergent will make a big difference in getting it clean. Mr. Clean Magic Eraser and some dish soap will remove a lot of the soap buildup. Use vinegar and water and a scrub pad. Using lemon oil and lightly polishing the glass when you are finished will leave the glass shiny and repel some of the soap buildup. On a daily basis, make sure that you wipe down the walls and floor—standing water is what allows mildew and mold to grow. Discover more helpful cleaning tips from Molly Maid. Cathy Tichy is the owner of Molly Maid of Central Omaha and Council Bluffs 4230 L Street Omaha, NE 68107 402-932-6243 providing cleaning services to Omaha, NE. Each maid services team comprises insured, licensed and uniformed housekeepers who are regularly supervised. Click here to request service in your area.